Fernox F5 Powerflushing Cleaner is a Heavy Duty Universal Cleanser that is a quick and effective neutral cleanser for central heating systems. It is designed to be used in conjunction with Fernox Powerflow MK III unit ( but is compatible with all know makes of powerflusing machines) to remove all debris, sludge and scale from existing systems of all ages. In this way, it will restore heating efficiency and eliminate or reduce boiler noise in heavily contaminated systems. It has also been designed for pre-commission cleansing new installations in accordance with BS7593:1992, removing flux residues and other debris, thereby helping extend the life of a system. For older sludged systems, Restorer is particularly effective when used in conjunction with a powerflushing unit. 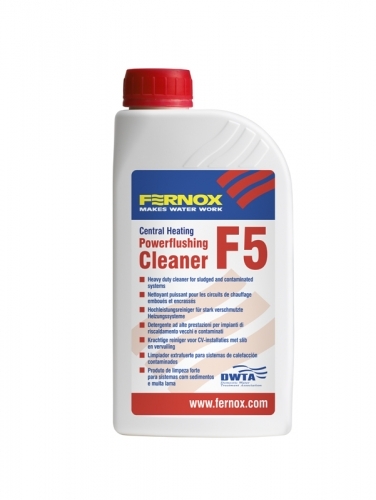 If the system is heavily scaled the use of Fernox Superconcentrate System Cleaner is recommended. Restorer is a neutral, non-hazardous product that is well inhibited and compatible with all metals and materials commonly used in heating systems.For continued long term protection the system should be thoroughly cleansed and flushed in accordance with BS7593:1992 and Benchmark using Fernox Restorer, before treating with Fernox Protector.